I still can't see mango on my witless network. How do I know that I have the driver for the usb installed ? Thanks . Now is working. There was only mango 3.3.0 beta 1.jar. I downloaded only the core as you suggested on the last link . I replaced only the lib folder. I restart mango an was little slow but ok. Then I was thinking that I need to replace everything what inside mango folder so I made a copy of the old folders and i replaced all the folders and files that are under mango with the new once downloaded from your link . I put back the m2m2 licence but mango don't start any more. I put back the old structure but with out success. So now I can't start mango. When I try to upload the file a window is telling me that I don't have the privilege to to that . I sent you the file via email. I sent it to Phil. You should get it from him. Was the easy way for me. This Mango ES is a new box and I did not setup any email yet. I reload the picture. Now I see that works. I only have access through SSH to Mango ES. The link that you sent looks like is about SQL . 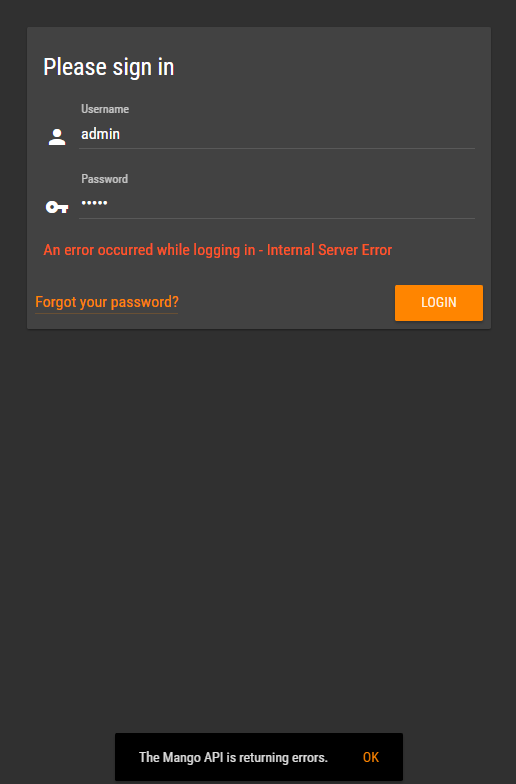 I try to log in my mango and I get this error. I am stack here. I can reset the SSH password but not Mango user in this case. BACnet module 3.3.1 is released! Here are the requested wireshark. Using the trick that I mention previous ( changing the ID of bacnet controller in the same time with the request from Mango to display the objects list) I was able to import the points. The problem is that the data base stop recording after a while. The Jace2 data base record every minute ( the default settings). If I stop and restart the data base the points start to record again for a while and stop after. This is stranger to me. It is not the first time when I use Bacnet but is the first time when I used with Mango V3. Any idea why . all thous issue ?